The Open Doors to Renting Reform statewide community consultation was held from 30 September to 30 November 2018. We asked tenants, rental property owners and property managers to share their experiences and feedback on how we can improve renting in Queensland. Renting is an important housing option for many Queenslanders, and most people will rent for part, or all, of their adult lives. Many people also see investing in rental properties as a way of securing their financial future. As the number of Queenslanders who rent continues to grow, we need to ensure our renting laws support access to a safe, secure and sustainable home in a stable rental market. Each week we introduced new themes for our discussion forums. 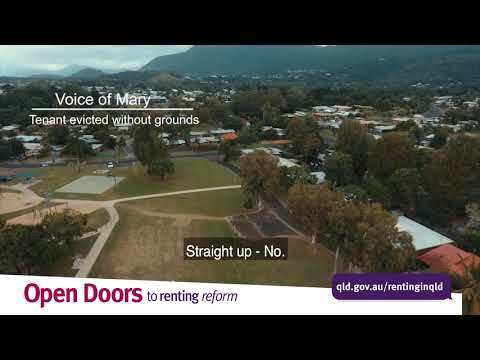 The Queensland community enthusiastically embraced the Open Doors to Renting Reform consultation, with more than 130,000 responses received. The experiences, views and information collected through the consultation will be analysed to help us identify reform priorities to shape the future direction of renting laws in Queensland. Register for email updates about Open Doors to Renting Reform. You can also see what’s happening on the @HousingforQld Facebook page - make sure you like our page to get the latest news. We will also publish updates on this site. Click here to play video Mary's story Mary shares her tenancy eviction experience. Click here to play video Jean's story Jean tells us why modifications can make a big difference.